Ornaments on the altar, such as this cross, were the subject of dispute in the Anglican church in the 19th century. Early Christian altars had minimal adornment. However, 19th-century supporters of the re-introduction of ceremony or ritual into church services adopted the use of a large number of altar furnishings such as candlesticks, crosses, flowers and books. This practice had been common on Roman Catholic altars in the 16th and 17th centuries. Crosses were especially controversial. They were associated with Roman Catholicism in the mid-19th century, and senior Anglican clergy often ordered their removal. 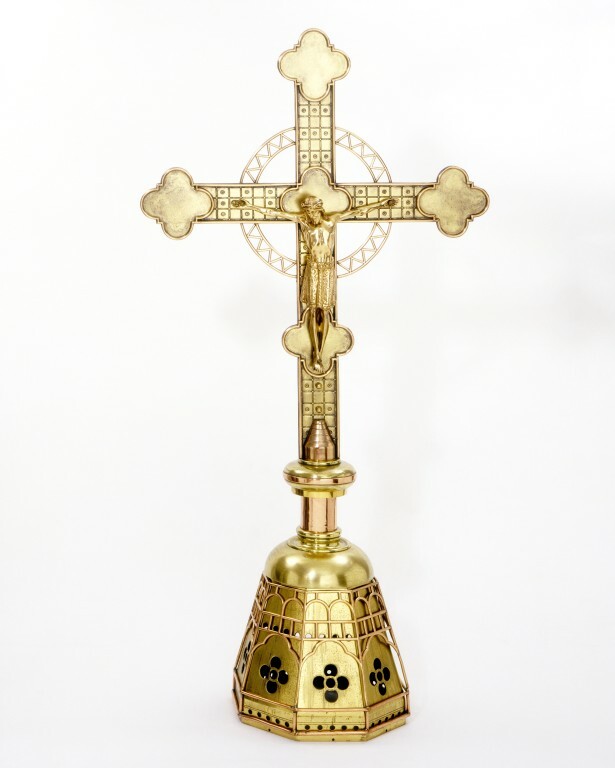 Brass church furnishings, a cost-effective way to furnish a church, were especially popular in the 1860s and 1870s. 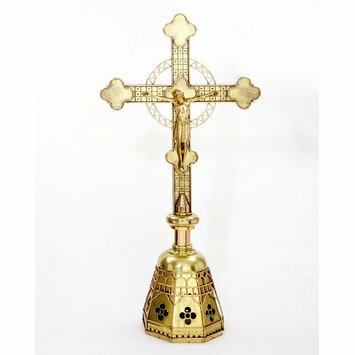 The style of this cross and other metalwork designed by the architect James Brooks (1825-1901) was influential at the time. His designs were less ornate than those of architects such as A.W.N. Pugin (1812-1852) and William Burges (1827-1881) and less concerned with reproducing authentic details of medieval pieces. By the early 20th century, designs similar to those of James Brooks were offered by a number of firms including The Artificer's Guild.